As a dietary supplement, mix two scoops (34 grams) into 12-16 Oz of water or your favorite beverage to taste in a shaker cup. No blender needed. Protalyn® Stack 6 (consisting of Whey Protein Concentrate, Whey Protein Isolate, Calcium Caseinate, Milk Protein Isolate, Egg White, and Montana Pea Protein), Natural And Artificial Vanilla Flavors, Sodium Chloride, Sucralose, and Stevia Leaf Extract. What do get when you combine ProtaLyn enhanced whey protein concentrate, whey protein isolate, calcium caseinate, milk protein isolate, egg white, and Montana pea protein? You get the ultimate protein formula available for feeding new muscle growth and recovery. Each protein form in Training Ground Protein 6 was specifically chosen to make this the best tasting, easiest mixing sustained release formula any athlete could hope for. 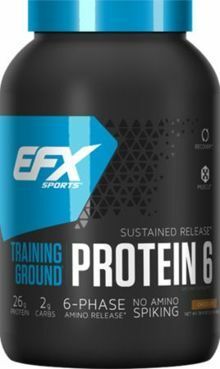 Training Ground Protein 6 is perfect before bed or any time you need a steady, consistent stream of amino acids delivered to your system.